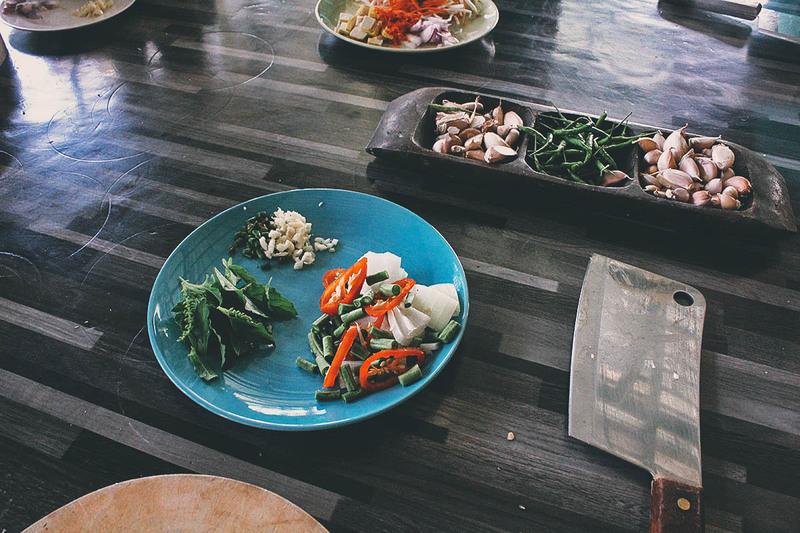 I Made the BEST DAMN Green Curry EVER at Mama Noi Thai Cookery School in Chiang Mai! I look so serious in that picture, like I know what I’m doing. Looking at it now, it’s like I had that “Eye of the Tiger” anthem playing in my head. I may look deep in concentration but I really wasn’t thinking about anything. I just didn’t want a rogue piece of chili to fly into my eyes while vigorously grinding those curry ingredients into a fine paste. 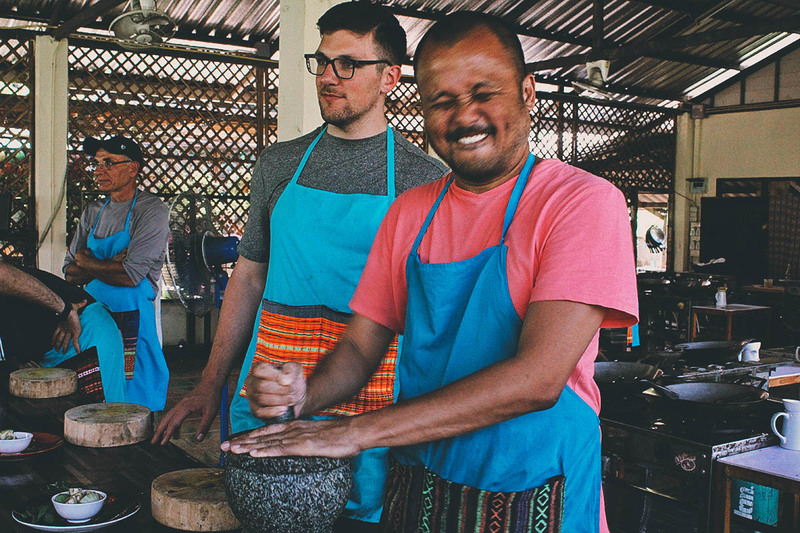 I don’t enjoy spending time in the kitchen but this cooking class at Mama Noi Thai Cookery School was one of the most fun things we did in Chiang Mai. When you don’t have to do any clean-up and virtually all chance of failure is eliminated, then cooking becomes a guaranteed joy, even for boneheads like me. All I did was follow our teacher’s instructions and I wound up with the best damn green curry I have ever tasted in my life. Seriously, it was that good. Here’s how I did it. 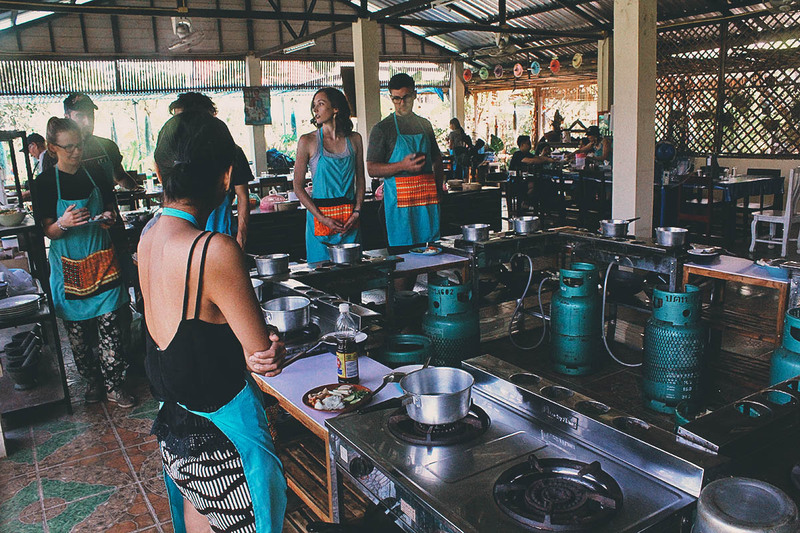 Taking a cooking class is one of the most popular activities in Chiang Mai so there are many cooking schools to choose from. 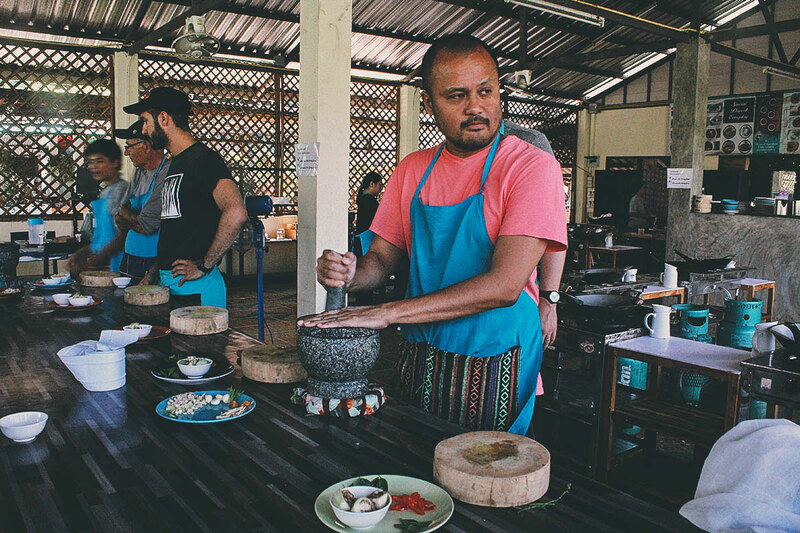 We booked our class through Kkday which took us to Mama Noi Thai Cookery School. They have a perfect 5-star rating on TripAdvisor with 371 reviews to date. Awesome! 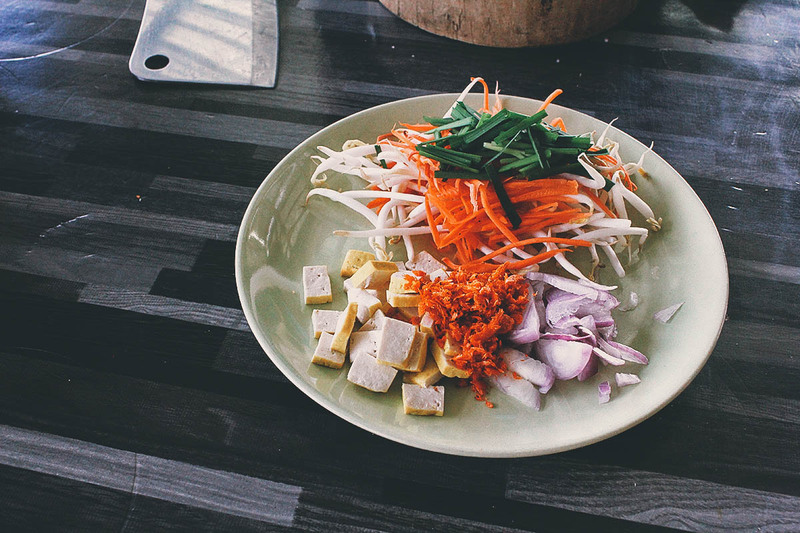 Mama Noi Thai Cookery School offers full and half day classes. 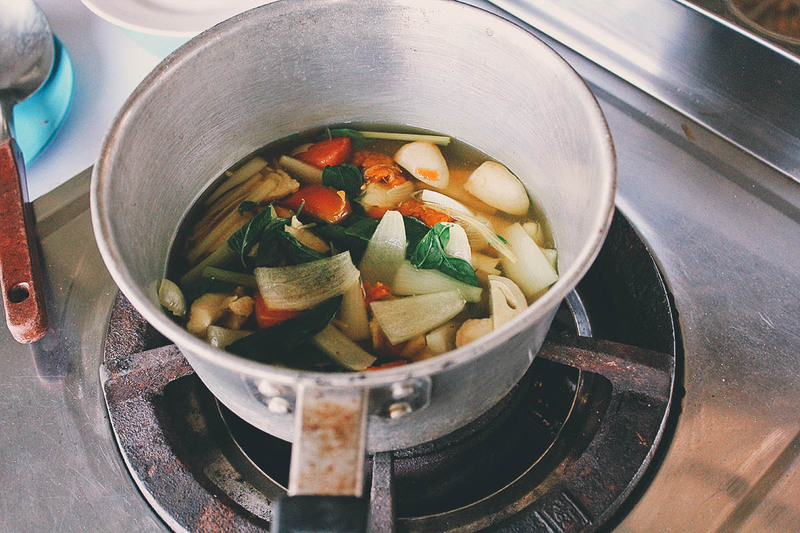 You’ll learn how to cook five dishes in the full day class and three in the half day. 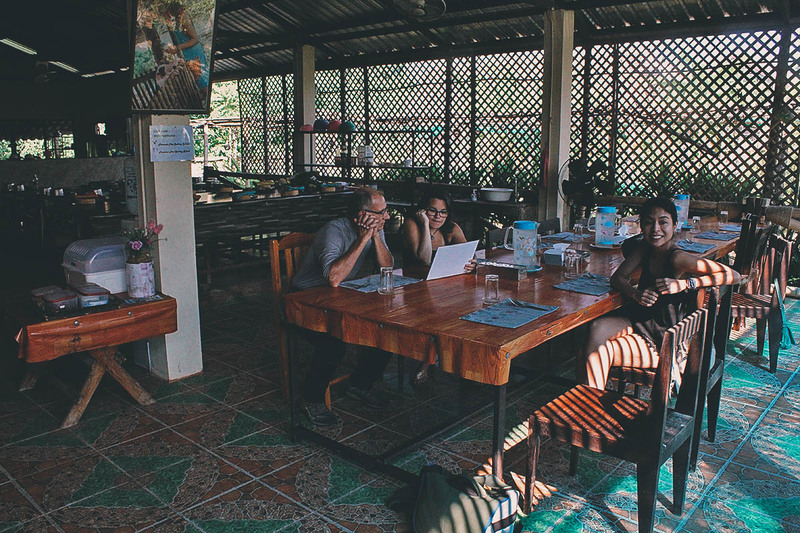 The full day class costs THB 1,000 per person while the half day costs THB 800. But if you book through Kkday, then they cost just THB 875 and THB 750 respectively. The class fee comes with roundtrip transportation from your hotel. 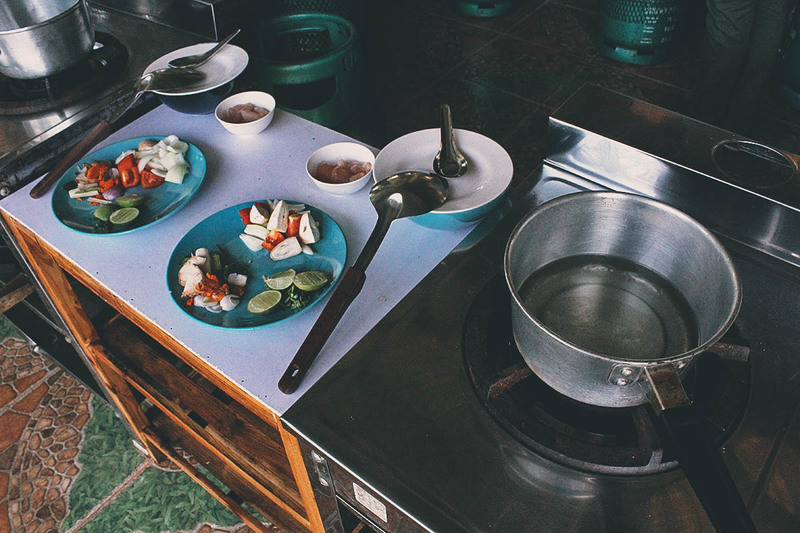 Welcome to my cooking school hahaha…welcome welcome hahaha…enjoy cooking yummy Thai food hahaha! 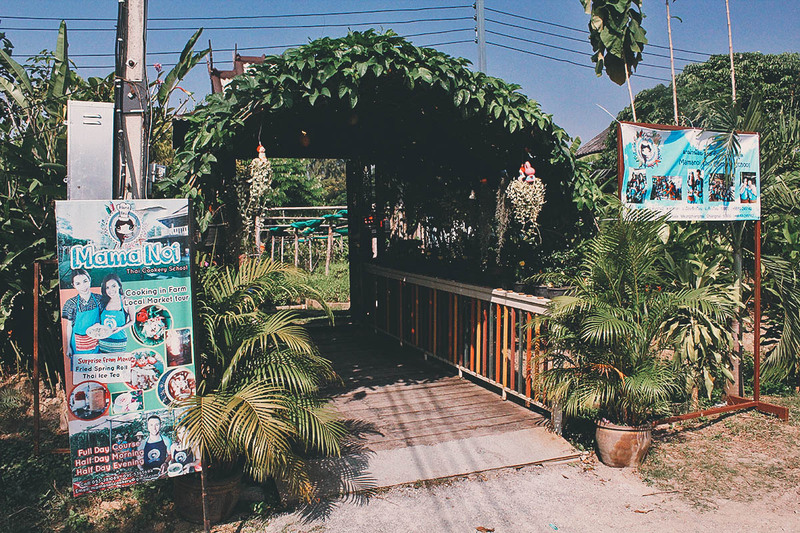 The garden setting at Mama Noi Thai Cookery School is pleasant and inviting. It feels good to be here. 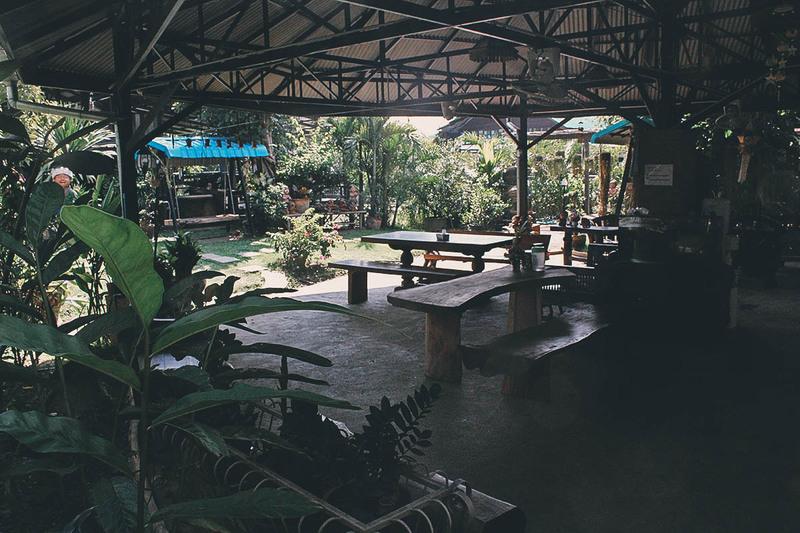 There are several large open air spaces which can hold multiple classes simultaneously. Here’s our group of budding chefs eager to start cooking. The classes here are small, maybe around ten students per group. We had eleven in ours – two for the half day class (me and Ren) and the rest for the whole day. Some of the ingredients for today’s class. This was the prepping station. Before you start, they’ll show you this menu so you can choose which dishes you’d like to make. There are at least three choices per course. People taking the half day class got to do a soup, a stir-fried dish, and a curry. People here for the full day did those three along with an appetizer and dessert. 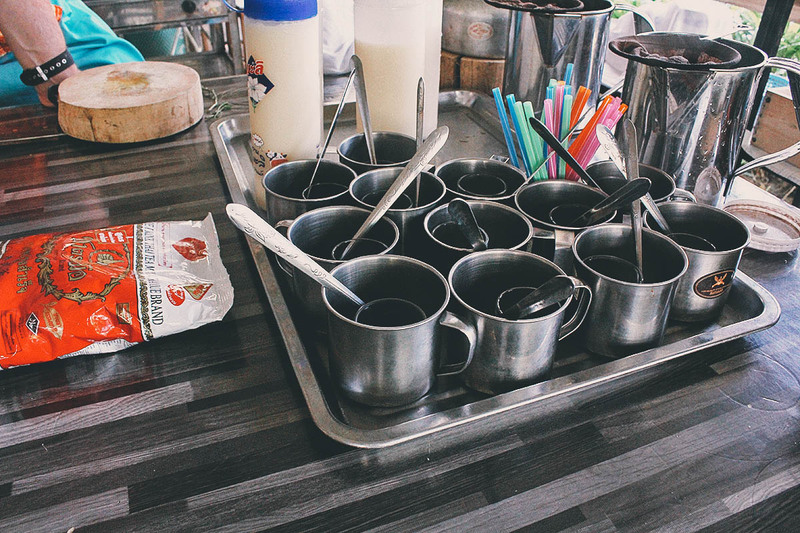 In addition to those courses, we all learned how to make fried spring rolls and Thai iced tea as well. 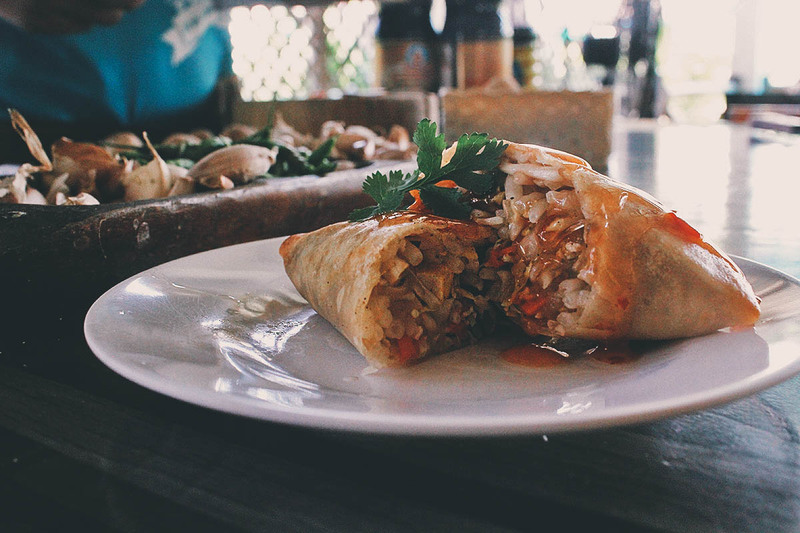 We started off with one of the bonus dishes – fried spring rolls. 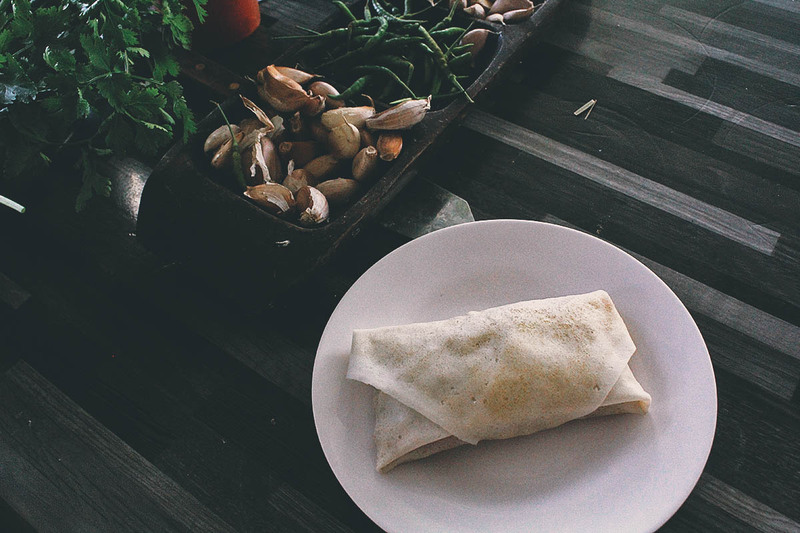 Everyone’s spring roll looked nice and cylindrical but mine came out looking like a Hot Pocket. In the end, it’s the flavor that matters. These spring rolls were delicious! I think these were the ingredients for our soup course. These ingredients are for khao soi. They have everything pretty well organized here. 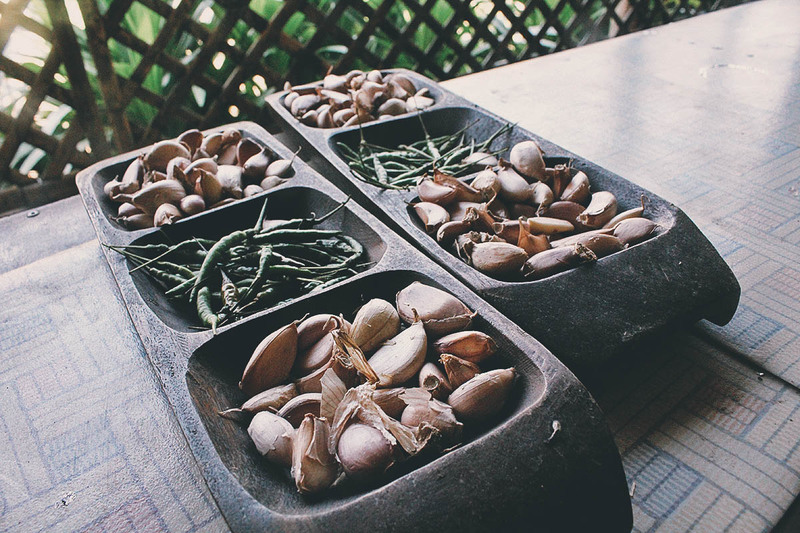 Everyone’s ingredients are laid out neatly before every course. I can’t remember what these were for. I think maybe the tom ka soup? 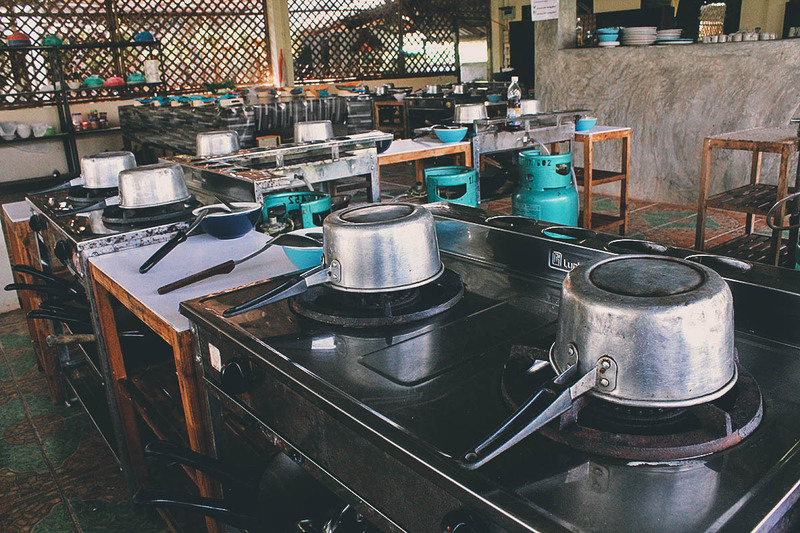 Regardless of which dish you choose per course, everyone preps and cooks simultaneously. Our cooking instructor Nutty did an awesome job making sure we didn’t slice off our fingers. I think this set of ingredients was for my pad ka pow or stir-fry chicken with hot basil leaves. 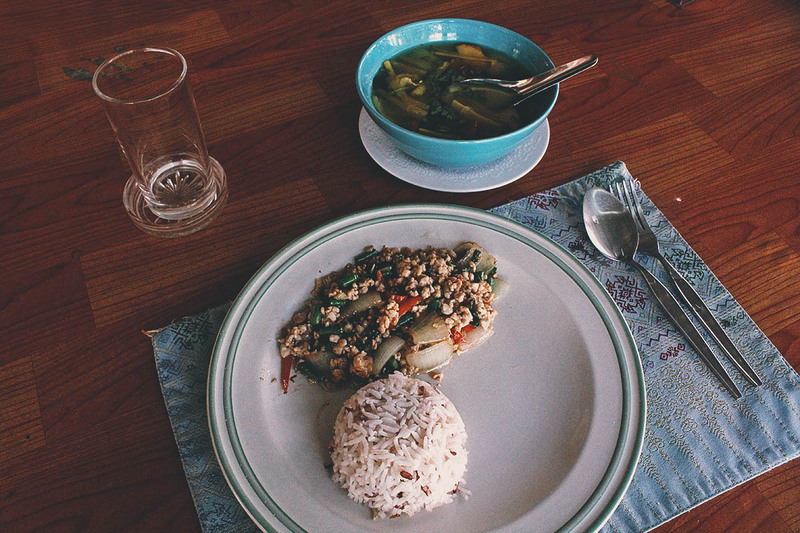 Because we’d be eating them together, we prepped and cooked the soup and stir-fry dishes at the same time. Now that our ingredients were all chopped and ready, it was time to cook! See what I mean? This was my beautiful tom som soup. For my soup and stir-fry, I did tom som and pad ka pow. Both were seriously delicious. With Instructor Nutty overseeing every step, there was no way you’d wind up with something that didn’t taste awesome. 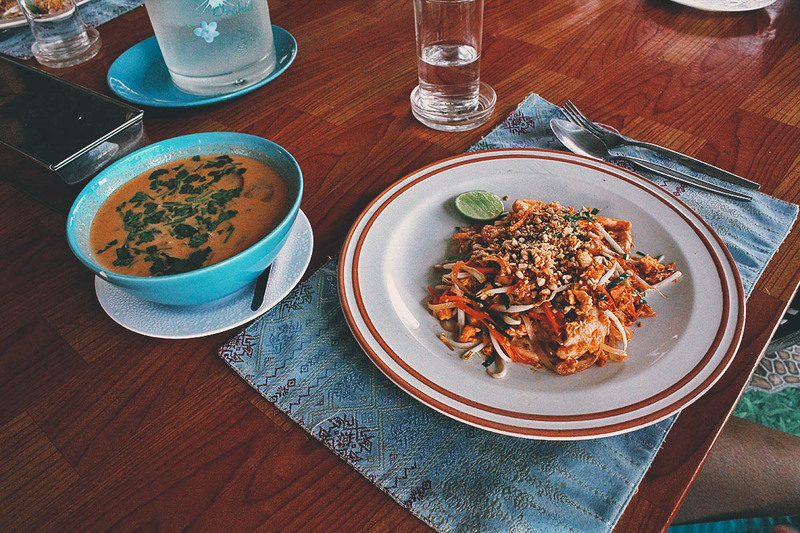 Ren chose to make the Pad Thai and tom ka soup. Both were incredibly tasty as well. We were full after just these two dishes alone! These were the base ingredients for my last and most anticipated dish – green curry. I love spicy food so I was really looking forward to this one. When Ren makes curry at home, she buys curry paste from the supermarket. Most people do. It tastes great but making your paste from scratch makes it a million times better. 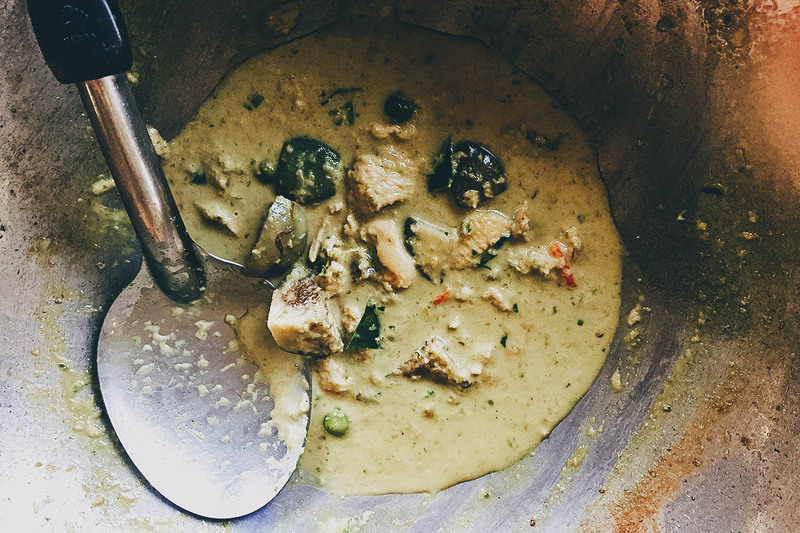 There were three of us on Team Green Curry so we took turns pounding the ingredients into a fine paste. My turn to pound those ingredients. 😆 The paste is supposed to have as fine a consistency as possible, which wasn’t easy to do. It’s no wonder people settle for the supermarket paste! 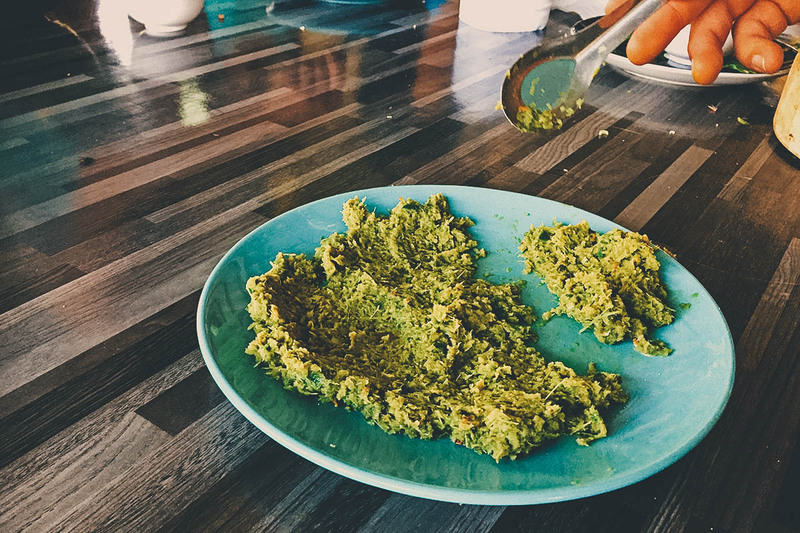 Our green curry paste mashed and ready to go. I know it looks like cud, but it tastes incredible. And there it is, the best damn green curry I have ever tasted in my life. I could seriously taste every ingredient I mashed into that paste. 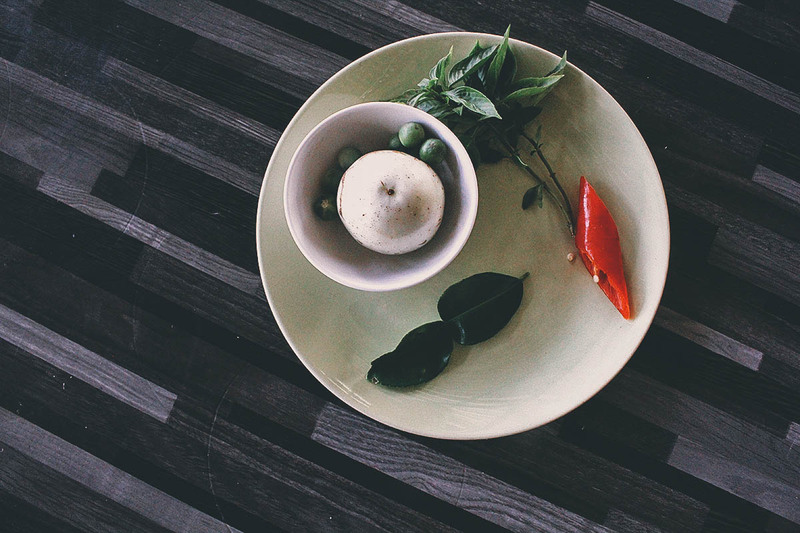 Making green curry paste from scratch using fresh ingredients makes a world of difference. I understood that in theory, but today I learned that in practice. We were so full from the fried spring roll, soup, and stir-fry that we had our curries to go and enjoyed them for lunch the following day. I think allowing it to sit overnight made it even better. Wow! For our second bonus dish, Instructor Nutty taught us how to make Thai Iced tea. 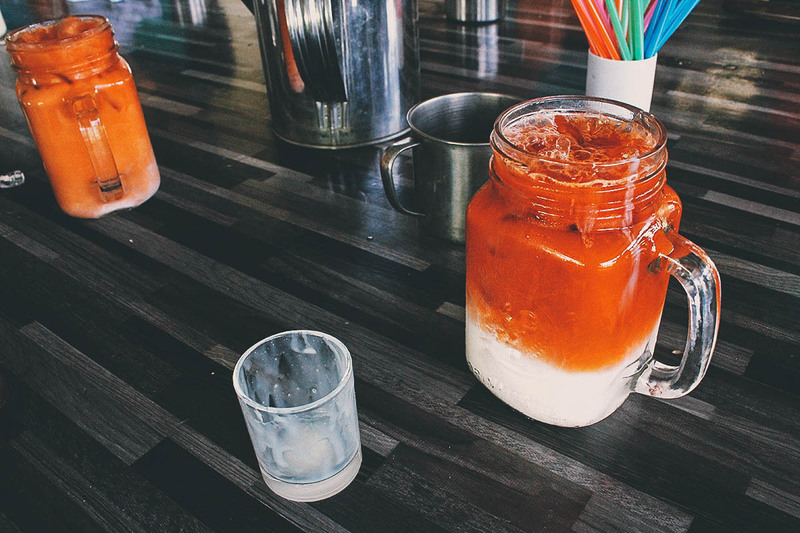 I love Thai iced tea and had it many times on this trip, so it was nice to learn how to make it. See that bag of black tea? We bought one just like it to bring back home. Heaven in a mason jar. Thai iced tea is one of my favorite drinks in the world. It’s so good! 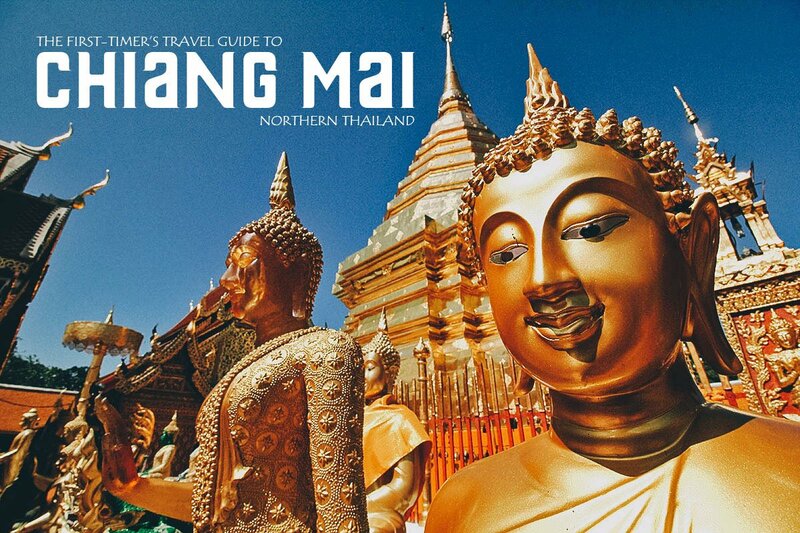 Check out this short video I put together of seven fun things to do in Chiang Mai, which includes footage from this Thai cooking class at Mama Noi. 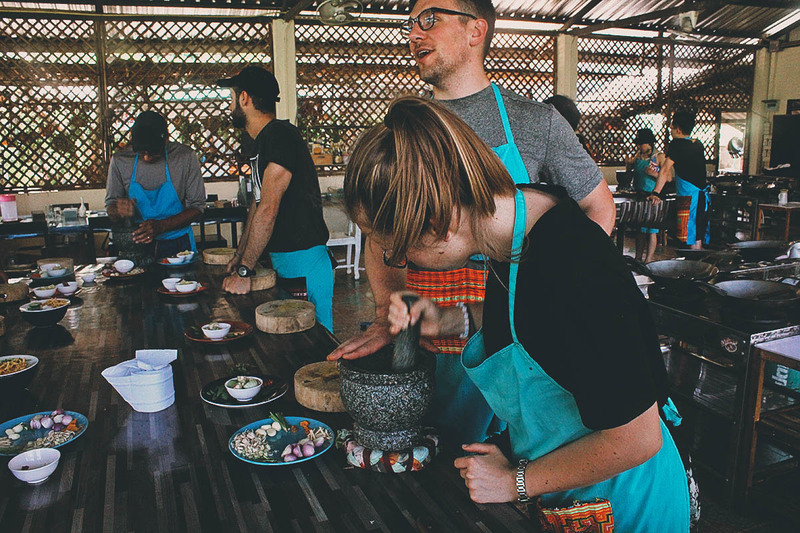 I think these cooking classes will be a permanent fixture on our itineraries from now on. 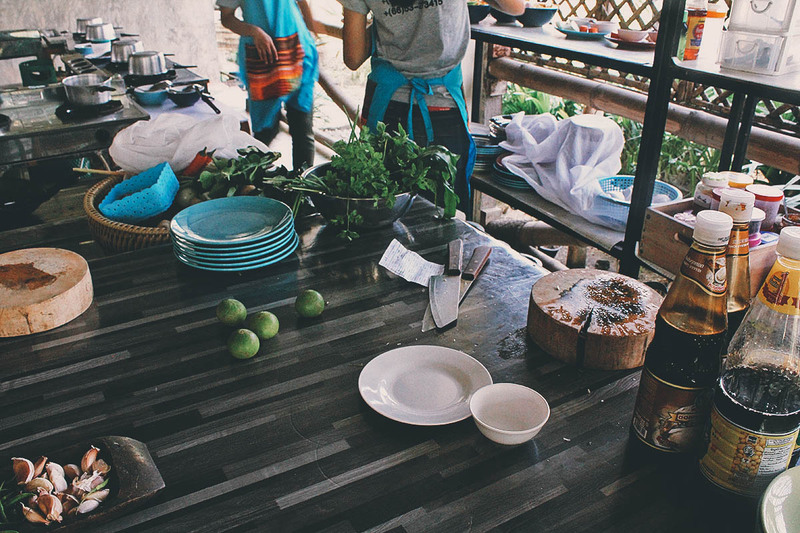 We’ve taken one other cooking class before, in Hoi An, Vietnam, and it was just as much fun as this one. 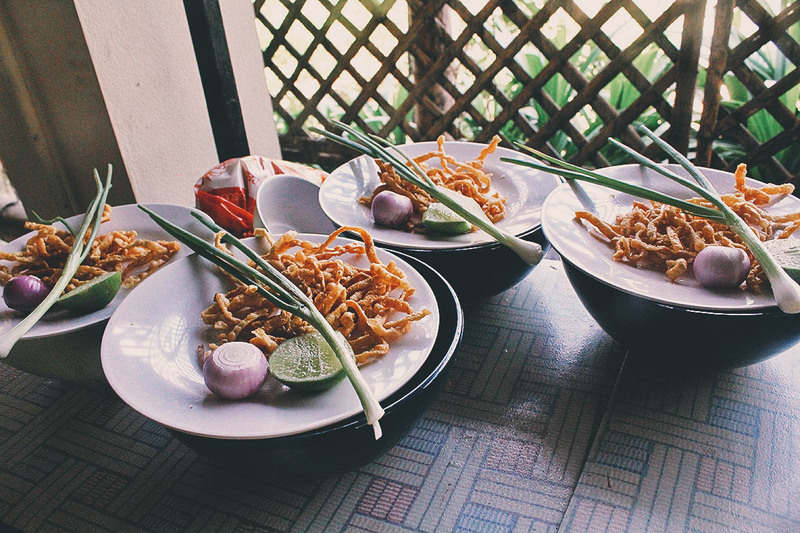 We love exploring local food when we travel and there’s no better way to learn about a culture’s cuisine than by making the dishes yourself. Ren and I did the half day course and we were happy with that. As described, we were so full from just the soup and stir-fry that we couldn’t even eat our curry! The half day class was great but if you want the full experience, then go for the full day course. I’ve listed the choices per course below to help you decide. 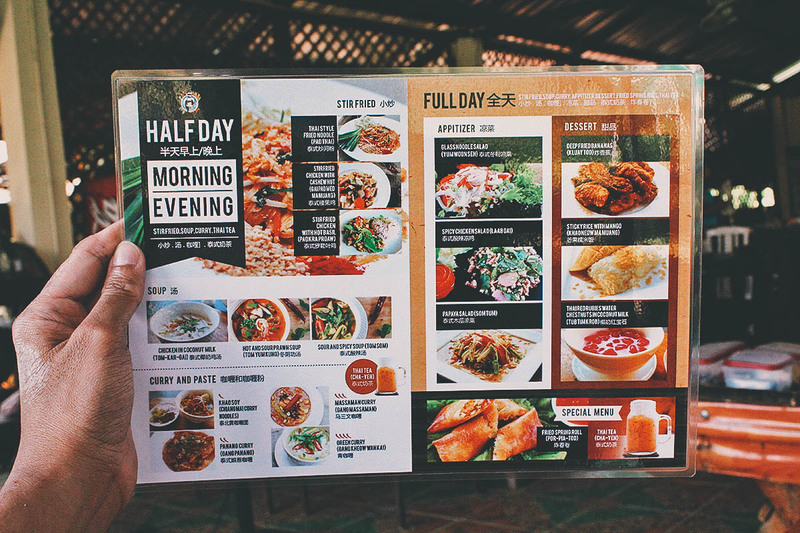 At the end of your class, they’ll give you a nicely designed booklet containing pictures and recipes for all the dishes they teach here. Love it! 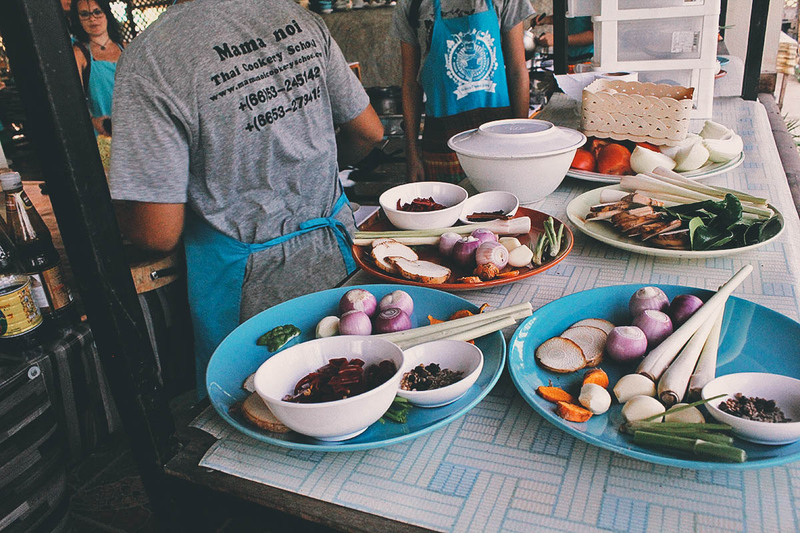 A cooking class at Mama Noi Thai Cookery School costs THB 1,000 for the full day course and THB 800 for the half day. If you book through Kkday, then it costs just THB 875 and THB 750 respectively. 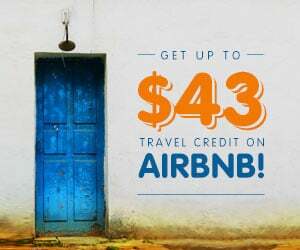 I’m a big fan of Kkday and visit their website often to find interesting deals when we travel. Students choose one dish per category. Same as the half day class, plus one dish from each of these two additional courses. I’m not sure if they always offer these extra dishes but everyone in our group that day – both half day and full day students – got to learn them. 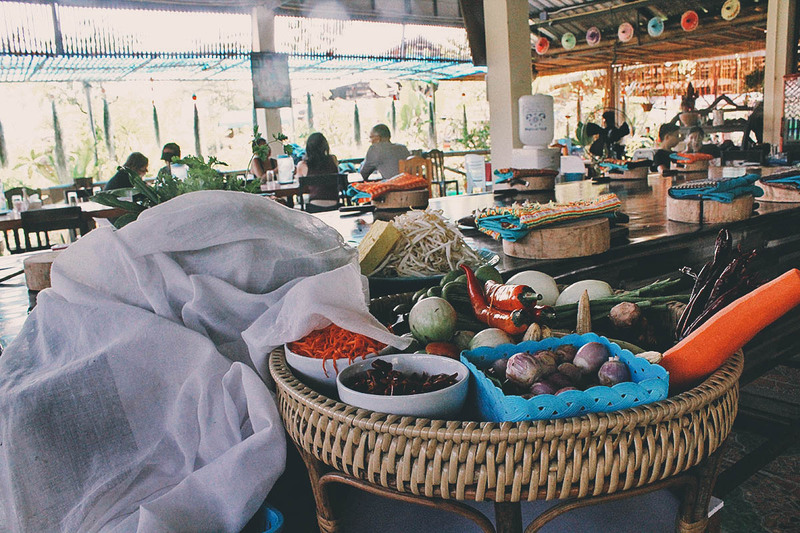 The cost for the cooking class comes with roundtrip transportation from your hotel in Chiang Mai. 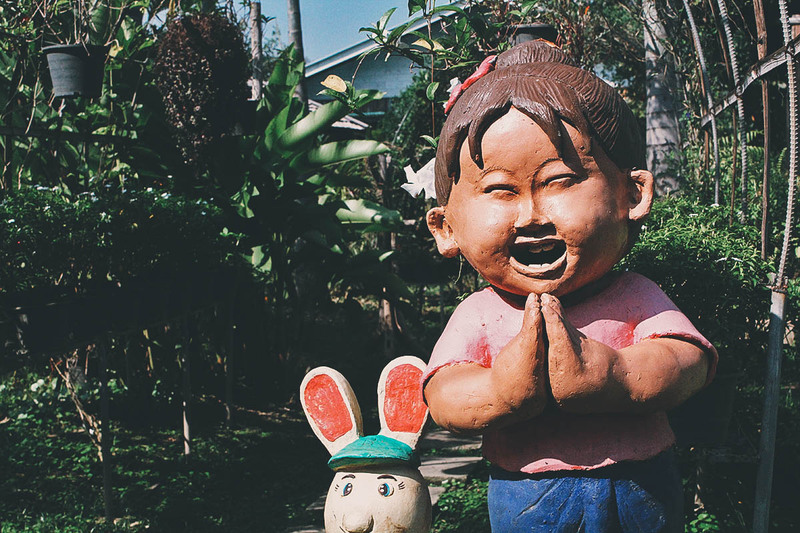 Otherwise, you can use Uber or Grab to get to Mama Noi Thai Cookery School. 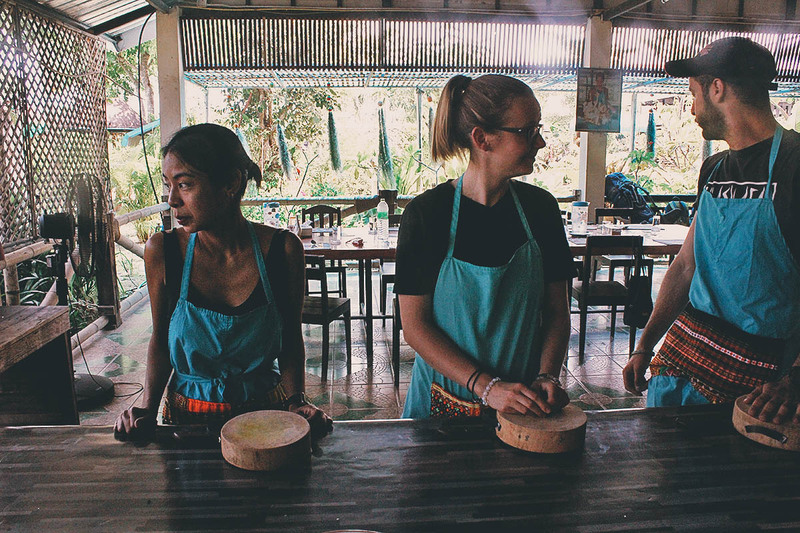 Kkday sponsored our cooking class at Mama Noi Thai Cookery School in exchange for an honest account of our experience. They didn’t ask me to do this. 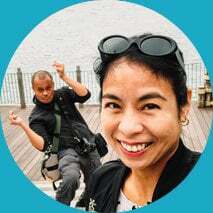 I went through their site and chose this activity on my own volition. As always, all words and opinions expressed in this post are mine and mine alone. The Kkday links in this post are affiliate links, meaning we’ll get a small commission if you make a purchase at NO extra cost to you. We really appreciate your support as it helps us keep this website going. Thank you!